A sunny afternoon at Chester depot finds quite a selection of Class 24s between duties. Prominent in the scene is 24133 the last of the box headcode equipped Class 24s to remain in service, and one of only two Derby built machines to make it to 1977. When January 1st 1977 rolled around there were only eleven Class 24s remaining in service. The Scottish Region had officially retired all remaining members of their allocation as of December 31st 1976, leaving the final eleven all allocated to Crewe. The last eleven in service comprised 24023, 24035, 24036, 24047, 24057, 24063, 24081, 24082, 24087, 24091 & 24133. To this list should also be added 24073 which was a surprise reinstatement in February 1977. Of these locomotives all but two were Crewe built - 24023 and 24133 were the only Derby built examples in this list. Because all the Darlington built machines had migrated to the Scottish Region these had all been retired by the end of 1976. And most of the remaining machines had been the last to receive any form of Classified repairs. The reinstatement of 24073 would add one more Derby built example to the active list. With the remaining Class 24s all allocated to Crewe depot their workings would tend to be very predictable with North Wales, Liverpool & Manchester, Stoke, Bescot and Shrewsbury all being high on the list of places visited by these eleven machines. And when they were permitted to work railtours they could still draw quite a crowd. 24087 & 24133 were the chosen machines on February 19th when called upon to work the NSPCC/Western Tours 'Lledr Valley Express' from Crewe to Blaenau Ffestiniog and return. In the view below the train is seen departing from Crewe. 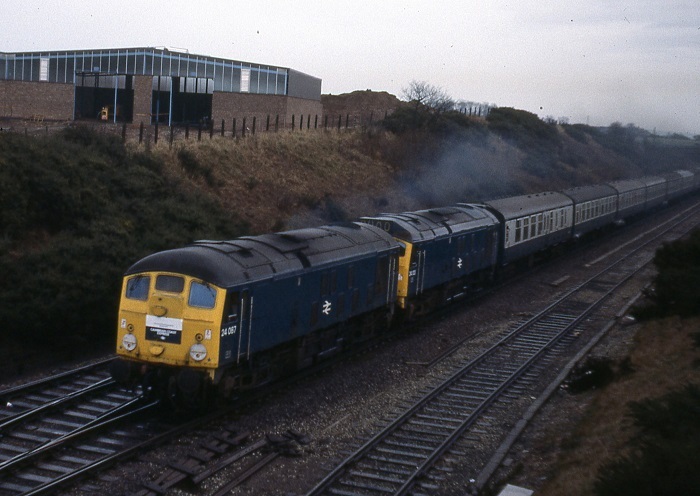 A reshuffling of Class 20's in February 1977 led to a possible shortage of locomotives on the LMR. Previously retired 24073 was reinstated to Crewe as part of a plan to cover the shortages. The transfers involving the Class 20's was rescinded so no more Class 24's were reinstated, however 24073 was kept in service. On March 19th a special Chester - Ramsgate excursion started its journey behind 24087, hopes of a trip to the south coast were dashed for the Type 2 when it was replaced at Wolverhampton! April 15th found 24035 & 24023 working a freight to Rugby, about as far south as the Class 24’s would now venture on a regular basis. A fine portrait of 24035, believed to be at Chester, date unknown. Clearly visible is the missing boiler water tank, a modification begun late in the working lives of the Class 24's and affecting only afew of the Class. 24047 & 24023 stand guard at Cockshute on May 7th 1977. Stopping in at Cockshute was part of the Sunday routine as we motored to Crewe for an afternoon visit around the Workshops. Cockshute at this time was invariably stocked with a variety of Classes 08/24/25/40 & 47's, the Class 24's being available for a variety of freight workings in the Stoke area. In the Hereford area on May 26th were 24057 & 25043 having arrived on a southbound freight. The Cardiff - Crewe service was very much in the hands of Classes 25/45/46/47, however Class 24's filled in from time to time when failures occurred en-route. During May the Stoke - Healey Mills freight was a regular Type 2 diagram, usually a Class 25 but May 23rd produced 24081 & 24087, whilst 24087 made the run solo the next day. 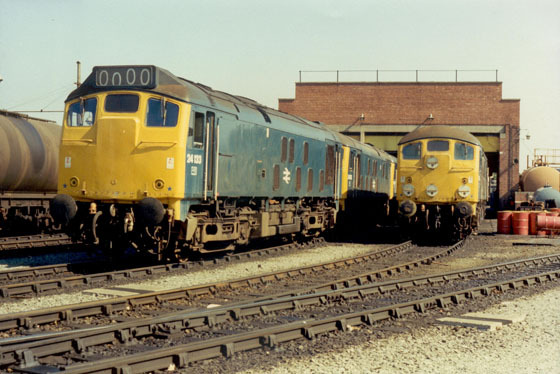 The Stoke area could normally guarantee workings for the remaining Class 24’s, they were still regular visitors on the stone trains from Oakamoor and Caldon, and Cockshute stabling point was a favourite place for them to layover. The remaining boiler equipped Crewe based Class 24’s were now popular on railtours, on June 5th 24082 & 24133 took twelve coaches on a roundtrip Crewe - Barmouth. This day we actually made a road trip to Barmouth in the trusty Hillman Hunter to photograph the Class 24's. We stopped on Talerdigg, managing one photograph of the train led by 24133 before moving on to Barmouth, which proved to be a busy place this day with several other excursions present. 24082 & 24133 head back across Barmouth Bridge on their way home - mostly a cloudy day but occasionally a weak sun shone through the clouds, much to the gratitude of the many photographers present this day. A wet June 11th 1977 finds 24057 and the Wigan Springs Branch breakdown train at Winwick Junction. Lenton permanent way yard was host to 25306 & 24087 on the afternoon of July 4th arriving with a load of rails, returning light engines to the west. Six days later 24087 & 24133 worked a Crewe - Manchester - Preston - Carnforth railtour. 24091 stands guard over its breakdown train on July 7th 1976 at Holyhead whilst railway staff endeavour to rerail 25327 over on the right. 24091 was another of the Class 24's to have its boiler water tank removed. The duties for the remaining Class 24's were somewhat predictable as evidenced by that of 24082 in the middle of July - on the 12th its duties included the 17.55 Bangor - Crewe parcels, 13th at Gresty Lane with an engineers train, 15th at Chester with a trip freight, 16th at Shrewsbury now attached to 25307 and 20th at Bescot. 24081 heads east from Llandudno Jct on August 26th 1977. The North Wales mainline would be familiar territory to 24081, spending much of its last three years plying this route with a variety of workings. A relief Birmingham – Norwich service on September 17th arrived at New Street behind 24023 from Oxley, regrettably 31151 was diagrammed to work the service. Two days later (19th) 24082 was in charge of a forty seven wagon Llandudno Jct - Mold Jct freight, the next day it was back at Llandudno Jct working two round trips to Amlwch. A pair of Class 24’s, 24133 & 24082 paid a visit to York on October 1st whilst in charge of the RCTS ‘Roses No 2 Rail Tour’. Originating from Crewe and picking up at Stockport, it traversed the Pennines via the Woodhead route. The former Great Central route was used to Treeton Jct, north to Rotherham, Mexborough & Doncaster then onto York via Knottingley. The return was via Normanton, Wakefield Westgate, Mirfield, Sowerby Bridge and Hebden Bridge for the run across Copy Pit, then Accrington, Blackburn, Bolton and Manchester Victoria. The Type 2’s made a fine run up Miles Platting bank before turning at Ashton Moss N & S junctions to reach the outbound route at Denton. The next day a number of their sisters (24023/35/36/47/63/81/91) were put to store, but promptly returned to service on October 3rd! 24091 keeps company with 24081 & 25288 at Chester depot on October 7th 1977. 24091 was stored unserviceable during October 1977 before being removed to Crewe for final withdrawal. This view is taken during the last days of its active service. A fine study of 24081 at Chester on October 7th 1977. The position of the blue star coupling code symbols indicate the last repair for 24081 was carried out at Derby, at which time the nose-end gangway doors were sheeted over. The aluminium cab shows no sign of rust as would be typical of the Class 25's. On October 25th 1977 24087 was diagrammed to work the the 9T50 coal train from Blaneau Ffestiniog. There was no traffic this day, so all 24087 had in tow was its brake van, both are seen here at Harwrwst. During October inroads were made into the remaining eleven, 24036 was taken out of service and put in store whilst 24091 was withdrawn on October 20th. 24036 would remain in store until November 20th when it was retired. On October 14th 24082 started its day at Llandudno Jct prior to working the 17.55 Bangor - Crewe parcels. The next day it was attached to 25043 to work the Ffestiniog Explorer between Crewe - Blaenau Ffestiniog and return. November 3rd found 24087 in charge of the 11.30 Cardiff - Crewe, presumably having taken over from a failure en-route, the return working featured 46028. December 3rd saw 24082 & 24133 handling a charter from Crewe to Aberystwyth via Chester. By the 16th 24082 was noted on the Holyhead - Manchester Mayfield Parcels with fourteen vans, probably one of the longer through workings that the Class 24's were able to make at this time. 24081 & 24087 were noted on the Shotton iron ore working on January 13th. One of the more adventurous railtours took place on a gloomy, overcast January 14th when 24082 & 24133 went up to the capital to work a St Pancras - Liverpool Lime Street charter, the Merseyside Express. The outward route was north from St Pancras to Wigston South Junction, Nuneaton, Water Orton, Sutton Park, Wolverhampton, Shrewsbury, Wrexham, Chester, Helsby, Halton Jct, Runcorn and Liverpool. The return was direct to Crewe, then Stoke, Stenson Jct, Sheet Stores Jct and south down the Midland Main Line to St Pancras. The 'Merseyside Express' accelerates through Water Orton on yet another really gloomy day, one almost wonders why we bothered to come out - but we did and another soggy memory went into the archives. On January 15th 24057 was taken out of service & retired. On a rainy overcast January 21st 24133 had an unusual duty being used on the last advertised passenger working of the Class 44’s, covering the Crewe - Chester leg inside of 44008 to provide heating following the non-appearance of the heater van. 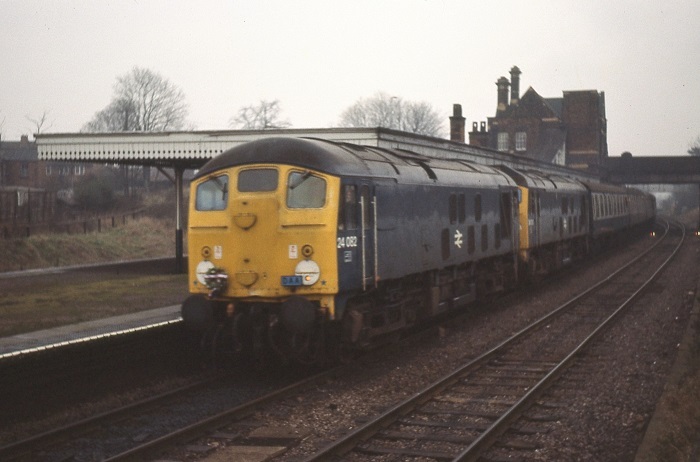 The last scheduled advertised passenger working of the Class 24’s occurred on January 27th, titled the ‘Cambrian Coast Express’, the Euston - Birmingham portion handled by 86224, where 24087 & 24133 took over for the trip to the coast. It is reported the multiple unit capability had failed, with a second driver assisting from Wolverhampton. The joys of going out to meet the final few Class 24 railtours was definately dampened by lousy weather that accompanied several of these tours. In the mediocre view above 24087 & 24133 are somewhere near Wellington. Indifferent processing by Kodak and not the greatest composition by yours truly didn't help either. Further details of this working are provided by Dave Plimmer. The train came to a rather abrupt stand five minutes after leaving Wolverhampton (eleven minutes late) with smoke blowing from 24087. There was a seven minute stop here, then a five minute stop at Codsall to report to the signalman, so to be 27 minutess down at Wellington was not bad. Here it was reported that a traction motor had burnt out. It had been hoped that 24082 might be at Shrewsbury to assist - no such luck. Despite the ailing 24087 no further time was lost, reaching Machynlleth 26 minutes down, although eleven minutes had been gained by not having to wait at Talerddig to cross a dmu – instead they waited 26 mins for the special! With thirteen on this was never going to be a fast trip. Fortunately 25165 was at Machynlleth, and took the Aberystwyth portion with 24087 in tow – apparently 24087 couldn’t manage seven coaches on its own. Back at Machynlleth in the evening darkness, there was a lot of activity prior to rejoining the two sections. 24087 was dumped in the sidings, and at one point 25156 was also put in the sidings and shut down. If it was the intention to have 24133 take the train back singlehanded this idea was soon squashed, 25156 was started up again, and the combined train left Machynlleth 41 minutes late. At Welshpool 25142 and 25154 were noted heading west on an engineers train – possibly one of these had been sent to replace 25156. Presumably the problems that befell 24087 on the railtour led to its withdrawal a couple of days later on February 1st 1978. Its last overhaul had been at Derby Works during November 1974. Time was also short for 24087's partner from the January 28th railtour - 24133 would be withdrawn on March 21st 1978. It's last repair had been at Derby during May 1975. This was the last of the headcode equipped to remain in service, and it left 24023 as the only Derby built Class 24 in service. On April 15th a Brighton - Blaneau Ffestiniog excursion arrived at Llandudno Junction behind 47436, the last portion of the trip going forward behind 24082 & 25043. By April 26th 24081 & 24082 were working together, being noted at Crewe before moving on 27th to Etruria to handle a northbound forty eight wagon freight. The pair were noted the next day back at Crewe. Passenger duty befell 24047 on April 29th when the 16.00 Crewe - Cardiff failed at Donington behind 25058 (or 25055?? ), the Class 24 taking the train as far as Hereford where 47358 took the train forward. On May 11th 1978 24036/57/80/91 began their final journey as the 12.30 Crewe - Doncaster via Derby, ironically the locomotives had a layover at Derby. The locomotives did not linger long at Doncaster, first to go was 24057 in May, the remaining three were all cut up during June. Photograph courtesy Tom Sutch The last remaining Derby built Class 24 to remain in service was 24023, here it is seen in a wonderful view at Penmaenmawr on May 16th 1978 in charge of a train of ballast wagons. 24023 has about four months left in service, none of the Class 24's built at Derby would reach preservation. June 8th & 14th saw 24023 & 24081 on the Shotwick iron ore workings. Its June 9th 1978 and the 07.42 Llandudno - Manchester Victoria is in the hands of 24082, seen here leaving Colwyn Bay. There are more details below on this passenger diagram. At the same time on the other side of the Pennines 24036 was in the process of being dismantled at Doncaster Works. The additional summer services and holiday extras provided plenty of unusual diesel haulage on the North Wales line, but the star turn was still the diagram commencing with the 09.42 Llandudno - Manchester. May 25th, June 8th, 9th, 28th - 30th & July 3rd & 4th saw 24082 on this diagram, July 6th & 7th had 24023. On July 10th 24047 got as far as Chester on 16.42 to Crewe, being replaced by 40145. July 11th & 12th saw 24023 again except it was replaced on the 20.30 Crewe - Bangor by 24063, getting only got as far as Chester before 24035 took over, which succumbed at Llandudno Junction! On July 19th 24047 worked only the first trip. 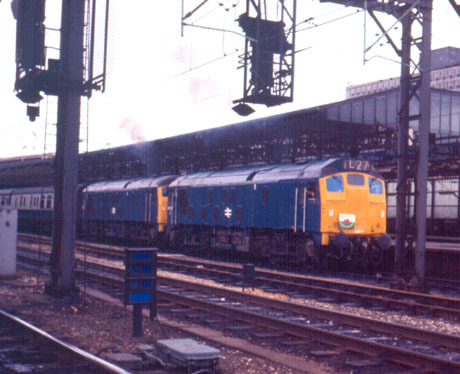 An unidentified Class 24 handled the 11.11 Manchester - Holyhead and 18.05 Holyhead - Euston on July 12th. A rare visit to Bedford with a rail train on July 20th was 24047, quickly returning north light engine. On July 24th 1978 railtour favourites 24087 & 24133 moved as the 06.30 Crewe - Doncaster Works for breaking up, en route they picked up 24137 from Toton. 24087 was broken up during August, 24133 followed in September and then 24137 in October. 24082 returned to the 09.42 Llandudno - Manchester passenger diagram, working it on August 21st - 24th & 28th - 30th! At the end of August 24081 was busy in the Llandudno area, on 25th it worked a trip to Holyhead with thirty four wagons, it was noted back at Llandudno on 28th, the next day it worked the 17.55 Bangor - Crewe parcels. During September 1978 the two remaining Derby built examples 24023 & 24073 were withdrawn. All the remaining active Class 24's came out of Crewe Works. Elder stateman for the class was now passed to 24035. 24023 & 24073 moved as the 9Z10 05.00 Crewe - Doncaster Works on October 23rd 1978 for scrapping. 24023 was scrapped during November followed by 24073 in December. On October 11th 24063 was noted at Healey Mills. The following day 24063 was in charge of the 01.25 Manchester Victoria – Bangor, but failed on route, believed replaced at Chester by ?? 24035 was withdrawn during October 1978. Elder stateman of the Class was now 24047. On November 13th 24082 worked the 11.41 Garston - Margam empties as far as Hereford. Nineteen years of service came to an end for 24047 on November 11th when it burnt out its main generator at Mickle Trafford whilst working the 08.39 Shotwick – Stoke freight. It was assisted to Northwich by 40020, where it was left on shed. 40125 towed it away on November 15th in the 22.44 Northwich – Bescot freight, being taken out at Stoke and dragged alone to Crewe by 40125. By December 13th it was on its way to Doncaster Works accompanying 24035. With the demise of 24047 the elder stateman became 24063. Happier times for 24047 as it goes about its daily business, possibly in the Chester area, date unknown. A Christmas present for the cutters at Doncaster were 24035 & 24047, their last move was the 9Z10 05.00 Crewe – Doncaster on December 13th 1978. Both would survive into 1979, just barely - 24035 was gone during January & 24047 in February. Some traditions of the Class 24's would remain to the end, even though only three Class 24’s remained in service (24063/81/82), they were noted several times at the end of January working in pairs on various Shotwick workings. The shadows are lengthening and the snow crunches underfoot as 24081 heads through Baego on an unknown date sometime in 1979. This is believed to be on a working from Brymbo. On February 7th 24081 & 25290 were in charge of the 05.38 Healey Mills – Northwich and 09.20 return. During March 1979 24082 was retired, it had run just over four years since its final overhaul at Derby Works during January 1975. 24082 would not remain long at Crewe, on March 20th 1979 it moved as the 9Z15 17.40 Crewe – Derby St Mary’s, attaching 50018 from Laira for ongoing movement to Doncaster Works. By April 24082 was no more. Late into March the two remaining Class 24’s 24063 & 24081 were still soldiering on, observed on the Oakamoor sand train were 24081 & 25215 (28th) and 24063 & 25159 (29th). During April 24081 was a regular visitor to Hereford. It arrived with 25211 on 9th on a freight from Stoke to South Wales, returning north with the 15.10 Radyr – Shotwick. On 15th & 21st it arrived with a continuously welded rail train, the latter time with 25159. Regrettably from April 10th 24081 would be the last remaining Class 24 in service following the withdrawal of 24063 the previous day. Whilst working the 14.20 Bidston Dock – Shotwick iron ore service the locomotive collided, at Shotwick, with some wagons from the local trip working hauled by 25158. All was not lost for 24063 however as it would later surrender its power unit to the Derby Research locomotive, 24061. Better times for 24063 as it comes off the Menai Bridge with a ballast train, presumably sometime during 1976. This was another of the Class 24's to run with iots boiler water tanks removed. On July 2nd 24063 departed Crewe for the final time, as the 9Z50 09.00 Crewe – Tinsley freight, adding RDB968007 (24061) & 74010 at Derby. The cavalcade reached Doncaster Works on July 4th allowing for an engine swap between the two Class 24’s. By the end of the month 24063 had been reduced to scrap, the last of this class to be broken up here. By this time Swindon had become the primary collection point for many of BR's scrap locomotives, Doncaster would not become prominent again in this area until the summer of 1986. On September 1st 24081 was on the goods yard shunt at Llandudno Jct, the next day it was at Aber with a permanent way working. On 3rd it was sent out to collect a failed 47536, an attempt being made to swap the locomotives with 40120 on the 11.30am to Manchester Victoria. On 4th it was sent to collect the morning Amlwych freight which had been left in the bay at Bangor, taking it forward to Llandudno Jct, 24081 then returned to Bangor to work a caravan special to Valley. The view below is dated September 9th so presumably this is the Amlwch freight to Llandudno Jct. 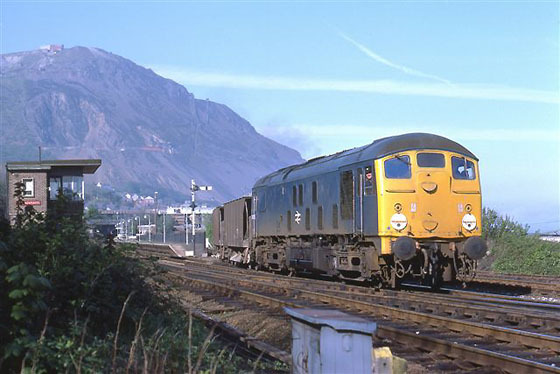 The sidings at the back of Penmaenmawr station is the location for this view of 24081 on September 4th 1979. The early morning 05.43 Grange – Shotwick freight on January 7th, in charge of 24081 got into trouble at Greenbank, with a main generator fault disabling the locomotive. Rescue came in the shape of 25071 as far as Oakleigh, where 25215 took the train forward with 25071 taking the errant Class 24 to Crewe. During October 1980 24081 was withdrawn. However its future was bright as preservation beckoned. With thanks to Dave Plimmer for information on 24081 & 24082.